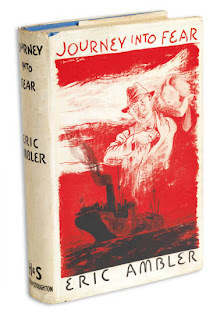 I'm reading Eric Ambler (1909 - 1998) for the first time this year, this month, last night. Even though I'd heard of him, obviously, for many years, I'd never read any of his work until I picked up INTRIGUE at the library - it features four of Ambler's more famous novels. I'm on the third one now, CAUSE FOR ALARM. I read JOURNEY INTO FEAR (1940) and A COFFIN FOR DIMITRIOS (1939) and really enjoyed both, even though I am not, generally, a big fan of spy novels - most of them are so damned grim and things rarely end well for anyone. I'm concentrating my review on DIMITRIOS only because it's the one I finished last night and its still fresh in my mind. Old-lady memory is notoriously unreliable past the second or third day after reading a book. I liked the first line of DIMITRIOS though apparently it is the comment of an omniscient narrator whom we, somehow, lose along the way. But no matter. As I mentioned, the novel takes a few beats to get going and that's my only quibble, -other than that it's a pretty perfect sort of spy story - revealed layer upon layer, picking up speed as it goes along. I haven't seen the film (I think it stars Zachary Scott one of the wierdest actors - in my view - that Hollywood has ever produced), but I think I just might watch it after this. Mystery writer Charles Latimer is tired; after writing a string of relatively successful books, he goes on holiday to Turkey, hoping that taking it easy for awhile might refresh him. 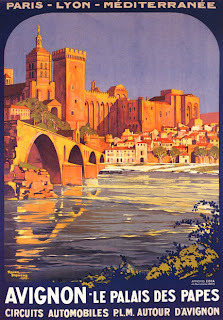 It is an uneasy time, war is fermenting in Europe and soon enough, exotic travel will be curtailed. He is a noticing sort of man as most writers are. He is also a curious man and it is this curiosity that gets him into trouble once he lands in Turkey and, typically, gets invited here and there for drinks and other social niceties. At one of these social events, he meets the oddly voluble Colonel Haki, head of Turkish secret police. Latimer is drawn into a mystery after Haki tells him of the dead body dredged that night from the river. It is a victim of murder, identified as Dimitrios Makropoulos. A known criminal type whom no one will mourn. On an impulse, Latimer asks to see the body, reasoning that it wouldn't do a mystery writer any harm to see a victim of violence. In truth Latimer's curiosity has gotten the better of him. Once he's seen the body of Dimitrios, Latimer, usually a reserved English gentleman, decides then and there to try and fine out more about the victim. What caused this particular man to be stabbed to death and thrown in a river? What were the ramifications of fate that wound up costing Dimitrios his life in such a brutal manner? Bit by bit, the more Latimer finds out, the more intrigued he becomes, the more he wants to know about Dimitrios Makropoulos, not just a petty sort of criminal (clearly) but a mastermind, an international gangster of the most vile sort. One of the things I like most about the story is how Dimitrios is shown from various perspectives, as Latimer searches out and interviews past acquaintances. There is no softening of his criminality, except a mention that Dimitrios' early life was hard - at that time, who's wasn't? But not everyone with a hard life turned to crime with such ease. No, Dimitrios appears to have had an enormous affinity for it. But it was useless to try and explain him in terms of Good and Evil. They were no more than Baroque abstractions. Good business and Bad business were the elements of the new theology. Dimitrios was not evil. He was logical and consistent; as logical and consistent in the European jungle as the poison gas called Lewisite and the shattered bodies of children killed in the bombardment of an open town. The logic of Michelangelo's David, Beethoven's quartets and Einstein's physics had been replaced by that of the Stock Exchange...and Hitler's Mein Kampf. Good writing, that. It brings to mind the current view of and rationale for the most hideous acts in a supposedly more enlightened age. Don't we view evil in the same way even now? Business is still all, it seems to me - what with corporate America's hold on government actions stronger than ever and the widening dominion of the internet. New theology, indeed. 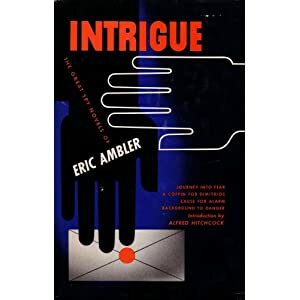 If you want to read one of the true masters of the spy genre, pick up Eric Ambler and indulge in his very well written, often prescient, novels. These guys from the past are called great for a reason. 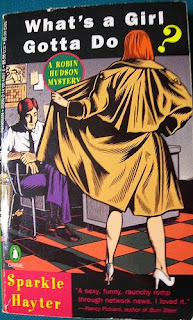 This review qualifies for entry in the Vintage Mystery Challenge. 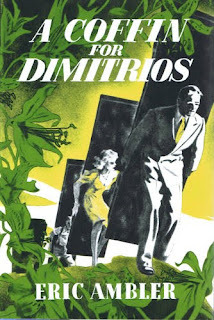 I'd like to list both JOURNEY INTO FEAR (not reviewed) and A COFFIN FOR DIMITRIOS. Both read, both enjoyed enormously. How's this for an idea? 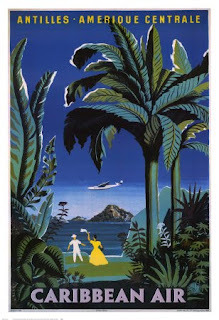 An Agatha Christie Theme Park!! Just thought of it. Am I brilliant or what? 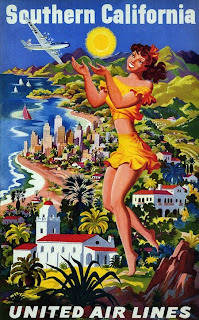 (Well, actually I was replying to a Christie comment from Martha on the travel poster post, when the idea hit me.) Why hasn't anyone ever thought of this? Imagine it: exhibits based on each of her more famous books - actors portraying the various characters. There would be rides based on the settings of her books. The park would have to be in England, I think. 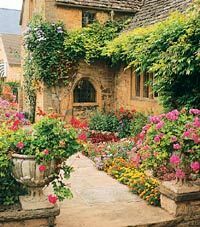 Or maybe in this country, it would be easy enough for people with Disney type money to create an idealized England setting. Though we'd also need the more exotic sets of some of her other books, i.e. 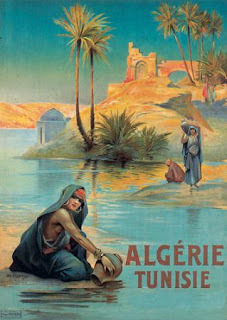 Mesopotamia, Africa, Egypt, the Balkans etc. There would have to be an Orient Express that runs throughout the whole park, of course. With murders conveniently staged along the way. For the millions of readers of Christie books with humor and imagination, it would be THE destination spot. The hotels in the park would all be named after one or more of Christie's characters, book titles, etc. 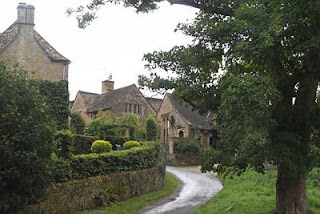 The Jane Marple Bed and Breakfast. 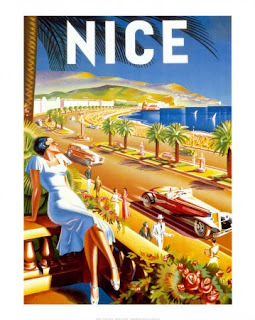 The Hercule Poirot Luxury Hotel and Spa. The Chimneys Hotel. The Harlequin Supper Club. The Thirteen At Dinner Supper Club. The Tommy and Tuppence Motel. The Body in the Vicarage Tea Shop. Three Blind Mice Tea Shop. 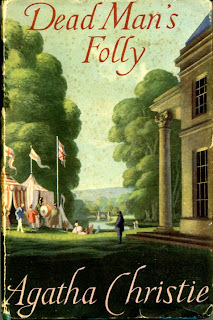 A Dead Man's Folly Afternoon Fete. thrown every afternoon, weather permitting. The possibilities are endless. Kids would get to know not only Christie's books but mysteries in general. They would share in the enthusiasm of their parents and hopefully become life-long readers. 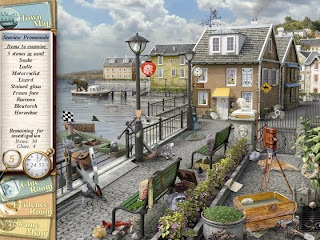 Note: The pix just below the Dead Man's Folly bookcover, is from some sort of Agatha Christie game I found online. The pix is all I have of it, though. Coming as we are, nearer to the February 14th deadline of our Short Story Challenge, (Hopefully you all haven't forgotten about it!) I thought a bit of useful writing advice might be welcomed for those of us stumped on a sentence or blinded by the glaring white of a blank page. (Figuratively speaking.) For more on the Short Story Challenge. ADVICE TO WRITERS A Compendium of Quotes, Anecdotes, and Writerly Wisdom From a Dazzling Array of Literary Lights Compiled and Edited by Jon Winokur seems just the thing to snap us out of our possible literary doldrums on this cold winter day. (The book was published in 1999.) From the editor's Introduction: This book will not teach you how to write. 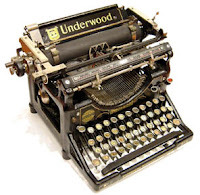 Whether you use a fountain pen or a word processor, writing is finally sitting alone in a room and wrenching it out of yourself, and nobody can teach you that. Begin with an individual and you find that you have created a type; begin with a type and you find that you have created - nothing. Nothing is as important as a likable narrator. Nothing holds a story together better. The characters have their own lives and their own logic, and you have to act accordingly. The artists who want to be writers, read the reviews; the artists who want to write, don't. 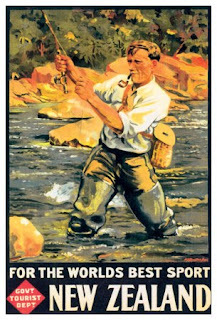 Listen carefully to first criticisms of your work. Note just what it is about your work that critics don't like - then cultivate it. That's the part of your work that's individual and worth keeping. Dialogue has to show not only something about the speaker that is its own revelation, but also maybe something about the speaker that he doesn't know but the other character does know. A man or woman who does not write good dialogue is not a first-rate writer. Remember that you should be able to identify each character by what he or she says. Each one must sound different from the others. And they should not all sound like you. Writing a book is like driving a car at night. You only see as far as your headlights go, but you can make the whole trip that way. As a writer you are free. You are about the freest person that ever was. Your freedom is what you have bought with your solitude. The mystery's very much the modern morality play. You have an almost ritual killing and a victim, you have a murderer who in some sense represents the forces of evil, you have your detective coming in - very likely to avenge the death - who represents justice, retribution. And in the end you restore order out of disorder. Anybody who shifts gears when he writes for children is likely to wind up stripping his gears. Examine nature accurately, but write from recollection, and trust more to your imagination than your memory. I know everything. One has to, to write decently. An essential element for good writing is a good ear: One must listen to the sound of one's prose. Real seriousness is regard to writing is one of the two absolute necessities. The other, unfortunately, is talent. You have to be a little patient if you're an artist: people don't always get you the first time. If you have enough talent. you can get by after a fashion without guts, you can also get by after a fashion again, without talent. But you certainly can't get by without either. Either it sounds right or it doesn't sound right. Do not pay any attention to the rules other people make...They make them for their own protection, and to hell with them. A good style should show no sign of effort. what is written should seem a happy accident. Read over your compositions and, when you meet a passage which you think is particularly fine, strike it out. I don't know anything about fingerprinting or ballistics or any of that stuff, and if you're any good you can fake most of that. When the plot flags, bring in a man with a gun. The trick is leaving out everything but the essential. Don't say the old lady screamed - bring her on and let her scream. The difference between the right word and the almost right word is the difference between lightning and a the lightning bug. When you sit down to write, tell the truth from one moment to the next and see where it takes you. Learn to write by doing it. Read widely and wisely. Increase your word power. Find your own individual voice through practicing constantly. Go through the world with your eyes and ears open and learn to express that experience in words. The shorter and the plainer the better. There isn't any secret. You sit down and you start and that's it. Sad News: The passing of author Ariana Franklin. I've just learned the sad news from The Rap Sheet, that one of my favorite authors, Ariana Franklin, passed away on Thursday. This is such a shock. She was a wonderful writer. I love her historical mysteries featuring 12th century coroner and King's investigator, Adelia Aguilar. These are richly defined mysteries with echoes of horror and insidious doings which the brilliant Adelia and her close coterie of friends must usually solve before they, themselves, are betrayed or killed. The enemies Adelia faces, brought to life so vividly by Franklin, often seem larger than life. The atmospheric trappings of the England of Henry II only enhance the inherent danger for a woman secretly commissioned to do a man's job in a perilous society where women had little value and no chance of being taken seriously as a doctor. Many of the historical details are eye-opening to say the least, though not always in a bad way. It was amazing to me to read just how much medical knowledge Adelia had (she'd been trained in Salerno) that the English didn't. 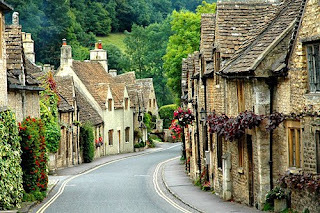 If you love great mysteries with a medieval setting, then these are the books for you. I only wish there could have been more of them for us to read. R.I.P. Diana Norman, aka Ariana Franklin. You will be missed. Are You Ready to Travel? I Am. Okay, I am officially fed up with winter. Here in the northeast we have been hit with snowfall after snowfall after...well, you get it. I mean, there's no place left to put all the snow. (What comes next when the snow beings to melt? Flooded basements, of course.) And now I hear there's another storm possibility for this coming Tuesday and Wednesday. Enough is enough, I say. 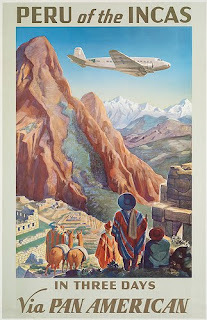 So, in the spirit of flying off to another place and time here are some fabulous vintage travel posters to get your mind off the ridiculousness outside. Yes, I realize that it's winter in some of those places as well, but let's just make-believe, shall we? Where's Mr. Peabody and the Way-Back machine when you need him? 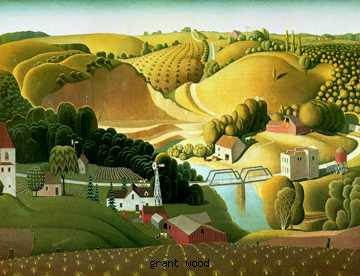 Wood's influential landscape style with its rolling hills painted almost literally AS rolling hills, his 'cartoonishly' round little trees, is nature at its most manicured - controlled yes, but also tactile, sensuous and very attractive. Contrast the static buildings scattered through-out the scene, dwarfed by the churning landscape. 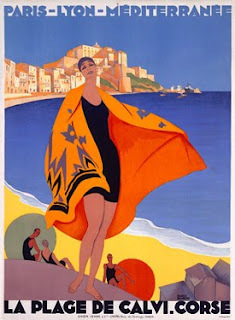 His work is instantly recognizable and like no other. 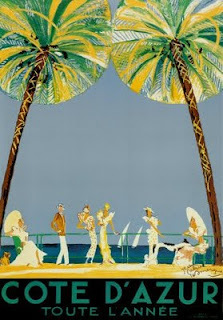 The influence of his authentic style on today's illustrators can't be overestimated. I am a major fan. 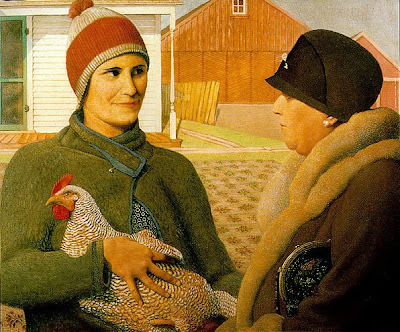 To read about Grant Wood's work, please go here. 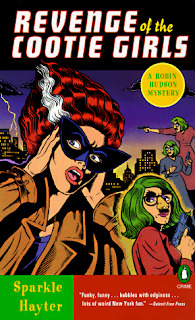 These are some of the catchy covers of one of the funniest mystery series you will ever read. The covers themselves by artist Mark Zingarelli, are so wonderfully done, so in keeping with the ditzy and surreal tone of the books,that I keep my little set of paperbacks in a special place just so I don't lose track of them. (That happens sometimes with paperbacks.) Just looking at the books makes me smile. The stories feature 37 year old Robin Hudson, a NY based TV reporter who works for the tabloid Special Reports Unit at the All News Network. She has a loathsome boss, Jerry Spurdle (And isn't that the most perfect name for a loathsome boss? All together now: YES! 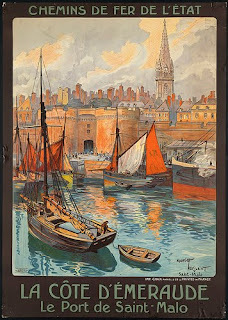 ), a NY apartment with insane neighbors, a cat named Louise Bryant, and a positive penchant for getting into trouble of the wierdest and most hilarious sort. I mean, the girl is a lunatic magnet. If it's ridiculous and murderous, it will happen to Robin. That's just her karma. Thunderbolt out of the blue: While writing this, I've just realized that I don't seem to have read the first in this series, WHAT'S A GIRL GOTTA' DO? Mainly because I don't seem to have it in the house. Hmmm. Well, that's easy enough to rectify. But I know I've read: NICE GIRLS FINISH LAST, THE CHELSEA GIRLS MURDERS, REVENGE OF THE COOTIE GIRLS and THE LAST MANLY MAN. So, when I say that you will laugh out loud and probably fall off the sofa or bed or chair or wherever you happen to be reading, I know whereof I speak. 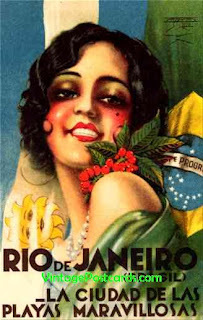 The books are mix of the absurd, the irreverent, the bold and the bawdy. Oh and damn good mysteries too. New York has never been funnier or more maddening. My mother had forgiven her for the custody fight. I hadn't. Thinking about Aunt Mo, I couldn't sleep for shuddering. It took me fifteen minutes just to will away the image of her that appeared every time I closed my eyes. I was able to relax only after replaying my CD twice and imagining myself in a peaceful place with a handsome man I used to love once, a long time ago. So there I was, perched on the edge of the gentle abyss, when, suddenly, the low-pitched siren of a car alarm went off on the street below, sending me bolt upright. ...Another went off, emitting intermittent shrieks, then another, and another. I opened my window, stuck my head out and saw a man running through the Con Ed mist, grabbing the handles of car doors and setting off all their alarms, including one that activated a car horn, which in this instance played the first few bars of the Godfather theme over and over. The man ran away. Up and down the dark steamy streets, lights turned on and heads appeared in windows. The insane symphony of car alarms was soon joined by a chorus of loud cursing that rained down on the heads of embarrassed car owners as they went out and turned off their alarms. After fifteen minutes only one alarm remained, the one with with the intermittent shriek. Another fifteen minutes and someone started shooting at the offending car until the alarm stopped. Jesus, there were guns everywhere. Well, this answered one of Life's big questions: Is the whole world nuts, or is it just me? Warning: This is the book that has Aunt Mo's trip to NY and the episode of the sofa, the glue gun and the bad guy. I can say no more. In my biased view, these books are just as funny if not funnier than Janet Evanovich at her best. So if you like Janet's Stephanie Plum, klutzy Trenton, NJ, bounty hunter books, you will love Sparkle Hayter's books. Plus, if you want another of my biased opinions, Sparkle's books have way better covers. 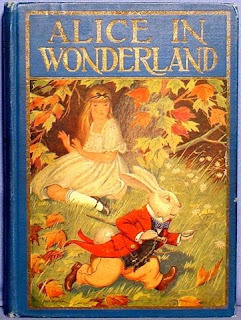 The poet and storyteller Charles Lutwidge Dodgson aka Lewis Carroll (1832 - 1898) was born on this date in Chesire, England. 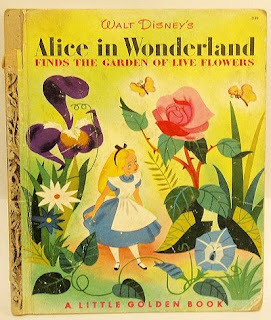 He was the creator of two of the most famous and well read books in the entire world, ALICE's ADVENTURES IN WONDERLAND and its sequel, THROUGH THE LOOKING GLASS AND WHAT ALICE FOUND THERE (both books commonly shortened to and instantly recognizable as, just plain Alice in Wonderland). The characters of which are equally if not more well-known than their creator. 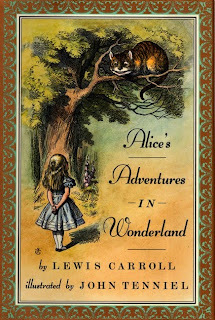 So, here's to old Dodgson, Happy Birthday Lewis Carroll! Since I seem to be in a western film frame of mind today, what with the snow and everything - my mind wanders when it's cold. I thought I'd post 10 favorite western films that you might or might not be familiar with. Next to books, I like nothing better than talking about old movies. In case you hadn't guessed that already. Okay, here's my ten (with two additional) - not necessarily in the order of preference, just as they occur to me. I could easily do another ten at the drop of a hat, since you'll notice that later films are not on the list. Some of my favorite westerns from the 70's, 80's and 90's are missing and yet to be catalogued. As excessively fond as I am of lists, I'll get to it at some point. 1) The Magnificent Seven (1960) starring Yul Brynner, Steve McQueen, James Coburn, Robert Vaughn, Brad Dexter, Charles Bronson, Horst Bucholz and Eli Wallach. The 9th member of the cast is the stirring and almost universally recognized dynamic film score by the great Elmer Bernstein. I am embarrassed to say that I can recite dialogue from certain scenes almost verbatim. I can also hum the music from most every scene.This is the first and only film I ever played hooky from school to see. I sat in Loew's Canal and watched it about four times (you could do that then). John Sturges directed. 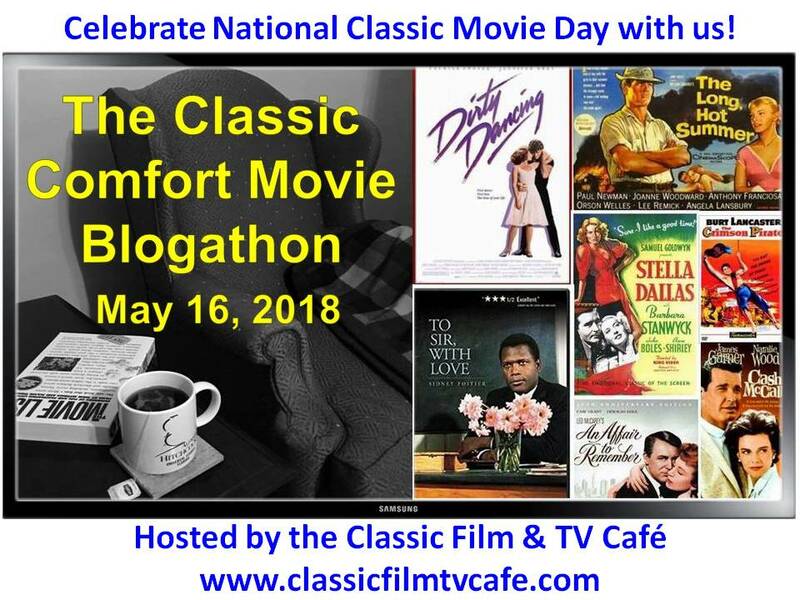 2) The Big Country (1958) starring Gregory Peck, Jean Simmons, Burl Ives, Carroll Baker, Charlton Heston, Charles Bickford and Chuck Conners. This is Gregory Peck at the peak of his perfection, if you care about such things. (I saw the man in person once in NYC, I know what perfection looks like.) Jean Simmons, too, looks great. Come to think of it, so does everyone else in the film. The opening credits are a Saul Bass must-see. 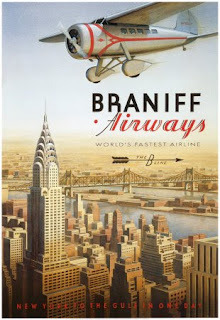 Not the usual Saul Bass, but great nonetheless. The score by Jerome Moross is brilliant. Burl Ives won an Oscar. William Wyler directed. 3) Stagecoach (1939) starring John Wayne, Claire Trevor and John Carradine. John Carradine as a refined southern gentleman gambler almost steals the picture. He is incredibly good. 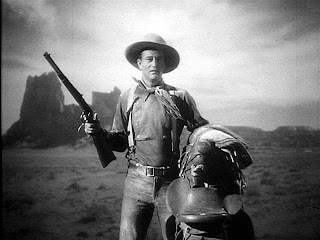 John Wayne's first appearance in the film is shot in a way guaranteed to make him a star then and there. I never did like Thomas Mitchell in anything, but I put up with him in this because the rest of the cast is so fine. John Ford directed. 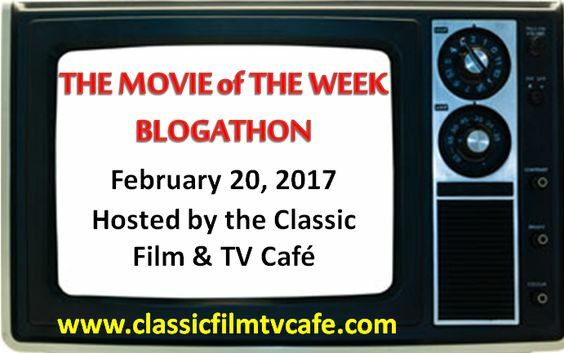 4) Blood on the Moon (1948) starring Robert Mitchum and Barbara Bel Geddes. I don't remember ever seeing Barbara Bel Geddes in any other film and it's a shame, she is so good and such a different kind of female movie presence. Throughout this entire film, Mitchum looks like he needs a good bath and maybe needs to lose a couple of pounds, but he carries it off. Mitchum could carry just about anything off. Physically he seems to overpower Bel Geddes, but they make that work as well. Walter Brennan is in this too, I think. Well, Walter Brennan was in just about every western made around that time. Robert Wise directed. 5) Tall in the Saddle (1944) starring John Wayne, Ella Raines and Ward Bond. John Wayne looks great in this and I love the black shirt he wears almost throughout the whole film. 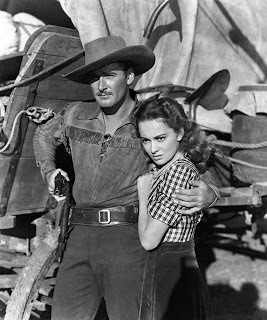 The interesting thing for me, in this otherwise run of the mill western, is the relationship between the simpering blond Audrey Long and Wayne and the dark and comely Ella Raines and Wayne. There's a bit of an obvious triangle, light and dark, good and evil, get it? Not that Ella Raines' character is evil, she's just more 'out there' - makes her preferences known, she (gasp!) wears pants and can shoot a gun. She's terrific. Who will Wayne choose? The answer is rather obvious, but it's fun to watch. Edwin L. Marin directed. 6) Red River (1948) starring John Wayne, Montgomery Clift, Joanne Dru, John Ireland and the ubiquitous Walter Brennan. Monty Clift at the height of his good looks, no question. John Wayne has to age from youngish man to older man and does it with style and a certain relish. You wonder, in the film, why a man like him never marries. (I think he's a widower from the beginning and stays that way, far as I remember.) To tell the truth, Joanne Dru looks like she'd be too much for Monty Clift to deal with, she looks better next to Wayne, but that's not how the story works out. John Ireland is unintentionally funny in a scene where he and Monty Clift compare the size of their guns. This is a great film with a great score. Howard Hawks directed. 7) Yellowstone Kelly (1959) starring Clint Walker, Andra Martin, John Russell, Ray Danton and Edd Byrnes. This film starred three of the handsomest men in the business: Walker, Russell and Danton. You see where I'm going with this? I'm a fan of big handsome men cluttering up the screen, and even better, riding horses. That is my weakness. John Russell took my breath away as Gall, a Sioux chief determined to behave with honor....sigh! Andra Martin is incredibly beautiful in this as an Indian maiden, and it's amazing to me she never became any kind of a star. I tolerated Edd Byrnes (late of 77 Sunset Strip) since he was there to appeal to the teens in the audience. Hey, I was 17 when I saw this and even then I knew that Walker, Russell and Danton were choice. Gordon Douglas directed. 8) Yellow Sky (1948) starring Gregory Peck, Richard Widmark and Anne Baxter. Gregory Peck plays an outlaw with a heart, Richard Widmark plays an outlaw without one. They both look good, especially Peck in a nice black shirt and very cool hat. (Hey, these things are important.) John Russell is in this too, but hardly visible as a henchman. Anne Baxter gets caught up in a mad dash to freedom when a band of bank robbers on the run, hide out in a ghost town where she and her grandpa (James Barton) are prospecting. William A. Wellman directed. 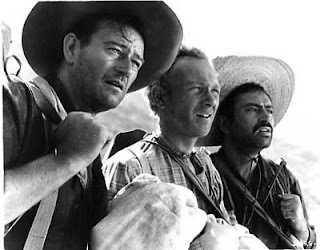 9) Three Godfathers (1948) starring John Wayne, Pedro Armendariz and Harry Carey Jr. This is such a classic story. (George Clooney made an update of this idea set in, I think, Iraq.) Three outlaws on the run find a woman about to give birth. She dies, but the baby lives. They are left with an infant to deal with. The thing is they must cross some sort of desert, they have little if any water and no way to feed the baby. 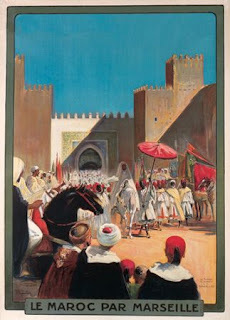 How they manage makes for such a heroic and splendid tale. I defy anyone not to be moved by the ending. John Ford directed. Two honorable mentions that I would love to see again, but haven't been able to in years and years. So I'm only going by long ago memory. Four Guns to the Border (1954) starring Rory Calhoun and Colleen Miller. Another Rory Calhoun feast for the eyes. Yes, I know, I am shameless, but hey, I was an impressionable kid then. Nowadays I hope I would be more circumspect. (Ha!) Colleen Miller is another actress I always wondered about - why she never became a big star. I guess there were lots of these B-movie actresses around and some just got lucky and some didn't. This film contains the best screen kiss - between Calhoun and Miller - I've ever seen. Whenever anyone asks me and I respond with this scene from this film, they look at me as if I'm crazy cause no one but me has ever seen it. (I exaggerate, but you get my drift.) Richard Carlson directed. 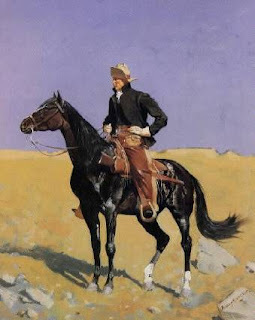 Note: the painting at the top of the post of the lone rider is, I believe, by Remington. Anyway, TV wasn't as expansive as the movies then. The movies were treasure troves. In those days, it was truly exciting to go to the movies on Saturdays - double feature and ten cartoons for a quarter. Early television couldn't beat that. Of course the matron with a flashlight chased you out after the first few viewings, usually round about 2 or so. But if you went early enough you could see the films and cartoons over and over if you wanted to. In some theaters they didn't chase you out at all if you behaved yourself. The theater names still vibrate in my memory: The Tribune, the Superior, Loew's Canal. Ah, good times. Westerns were my first love growing up. They were so exotic. So other-worldly. And those tall, taciturn, silent heroes....sigh! They knew how to take care of business, get rid of the bad guy and ride off into the sunset with the often simpering heroine. I wished the heroines weren't so simpering, and some of them weren't - Dale Evans, for one - but mostly we made allowances. But I have to admit, my favorite thing was the horseback riding. I could watch a good rider streak across the plains for hours. (I still can.) Roy Rogers was an especially smooth rider. I loved watching horses galloping across the screen, riderless, accompanied by a stirring musical score. I loved watching cowboys and Indians duke it out. Loved the chase part, mostly. I knew the Indians were getting a raw deal, but I watched anyway. I even loved watching stagecoaches pounding across the prairie. 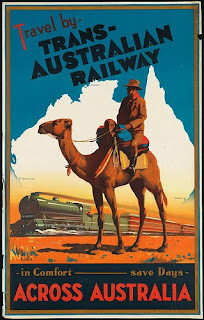 To me it was all thrilling and exotic. So, this book by William K. Everson is always nice reminder for me, of those happy days of yesteryear with a Hi-Ho Silver Away!! It was actually a gift in 1969 from my ex-husband and I still like to look through the pages. If you enjoy old fashioned westerns even half as much as I do - did - this is a book you might like to get your hands on. The Beginnings - And Bronco Billy. Some of the early black and whites I saw later on tv, there were terrific movie channels then. (Million Dollar Movie, The Early Show, The Late Show etc.) TV is how I became familiar with 1930's western star Bob Steele. I was a big Bob Steele fan. And Johnny Mack Brown (though I think I also saw Johnny Mack at the theater) and the hairy chested Lash LaRue and Red Ryder and Roy Rogers. Though I probably saw these guys in western serials in the theater early on as well. 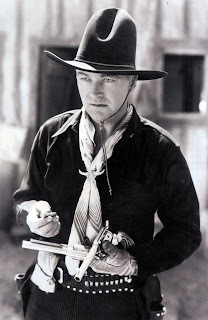 Oh, and who could forget Hopalong Cassidy? I certainly couldn't. And Wild Bill Elliot and Gene Autry and Tim McCoy and Hoot Gibson and Rod Cameron. There's lots in this book about the very early westerns, westerns even before my time. But they're fun to read about anyway. And I loved reading about Yakima Canutt, the best stunt rider, stunt man that ever was, at least according to the experts. John Ford used him in many of his westerns. Canutt stunted for John Wayne and many, many others. He was known for his ability to fall off a horse creatively. He was an amazing man, who, despite his profession lived to a ripe old age. Many of these westerns featured the early work of some of the best directors in films: William Wellman, Howard Hawks, John Ford, King Vidor, Robert Wise and the like. 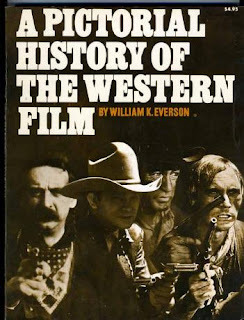 A Pictorial History of the Western Film is the sort of book you want to spend a little time getting to know. The sort of book you can dip into time and again. 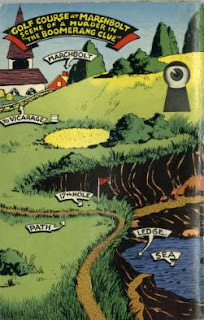 And for someone my age, of course, it's the sort of book that brings back plenty of good memories. Milena has created a beautiful blog, ARTIFEX ALMANACH, which I'd like to share with you. 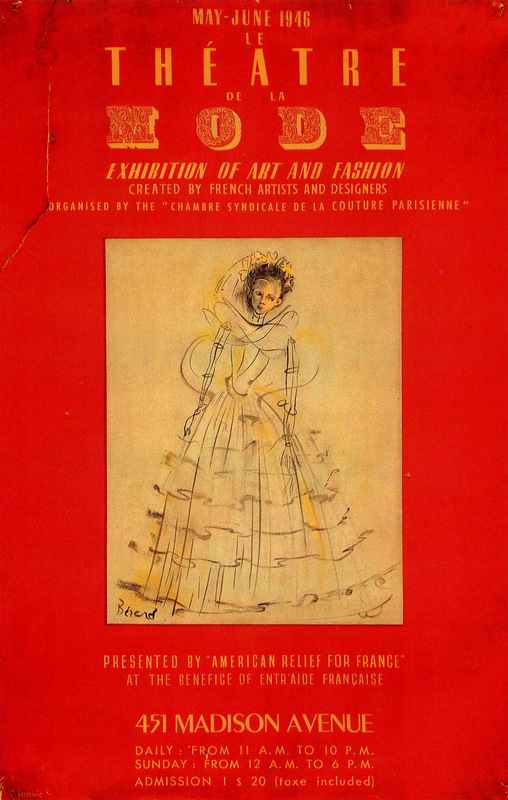 I was especially taken with this post, the second in a series Milena has written about the post-WWII activity of the French couture houses and their workers - the unexpected re-birth of the houses that survived the war. 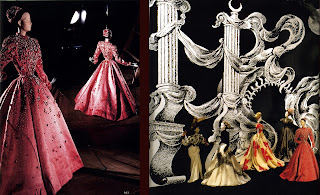 A beautiful miniature traveling exhibition, a reminder that art survives no matter what. I hope you'll take a look at Milena's blog and her expertly written and very well-researched post. 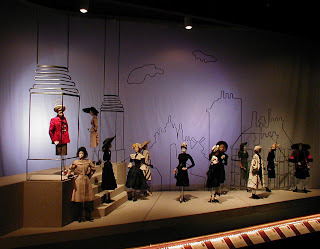 She is lucky enough to have seen all this in person, but we can view the photos and marvel at the creativity involved. It's an amazing story. The NY Jets Will Skip the Super Bowl Again. 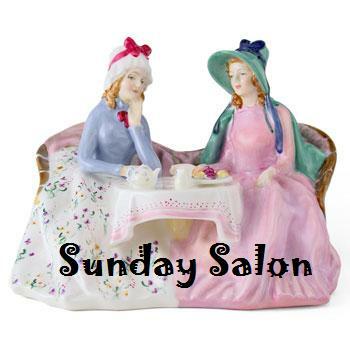 Sunday Salon: Joyeux Anniversaire Monsieur Manet! Alphabet Bag - LOVE IT! Fashions Galore, Never Mind the Awards! In the Mail Today: Books! 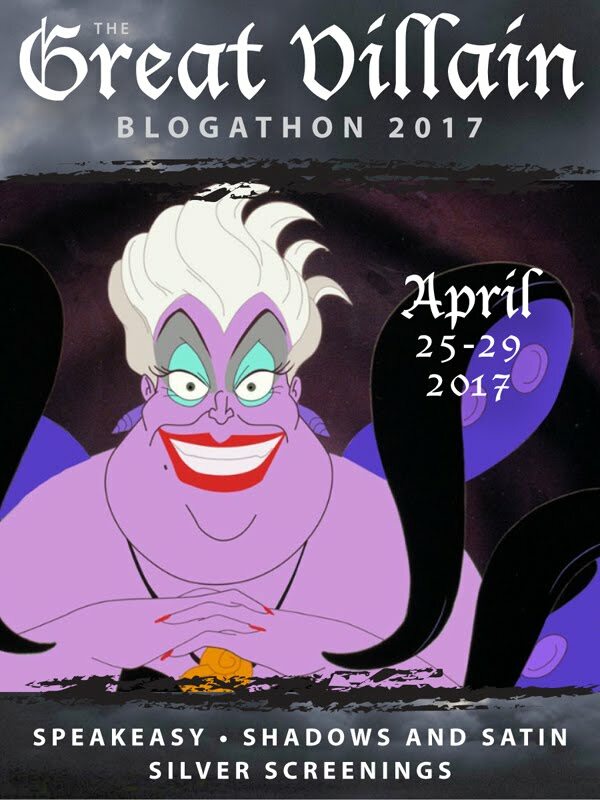 What are your favorite Book Beginnings? Sunday Salon: Summing Up: NFL Wild Card Weekend! A Rant: When Is A Book Not A Book? Sunday Salon: Short and sweet.